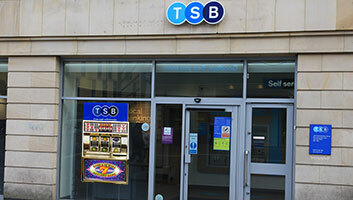 Ailing bank TSB has decided to replace all their hole-in-the-walls with fruit machines in a bid to liven up the banking industry still further, after their groundbreaking introduction of a data protection-deficient randomly-accessible new banking system. CEO Simon Williams said, “After the special, blue-sky thinking features we introduced last week, we’ve decided to go the whole hog with 100% insecure, unguaranteed roulette banking! “Let’s face it, banks are boring, unexciting places. All the same faceless, dull corporations doing essentially the same thing: looking after your money securely. “TSB is innovating to brighten up everyone’s day by either not giving them access to any of their own moolah, whilst simultaneously showing everyone else what you can’t access in your own account! “The introduction of fruit machines instead of cash machines is one way we can entertain our customers much more than other, more boring high street banks. “You put your card in. Or don’t – it really doesn’t matter. Guess a PIN. They all work, regardless of what you type in. Then, instead of amounts, different fruits appear on the screen. You can’t pick any of them, you can only pick ‘Spin’. Then, if you get three cherries, you win the amount of money you wanted. Or didn’t want. From your account. Maybe. “Building our reputation this way means we can get football shirt sponsorship like what all those gambling companies have. “We have an advantage over them though – they can only lose you part of your money of which you are in total control. With us, we can lose all of it without you even knowing!